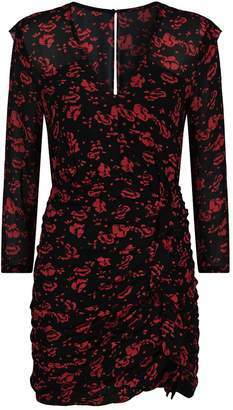 ALLSAINTS Harlow Eira Dress in Black. - size 0 (also in 2,4,6,8) ALLSAINTS Harlow Eira Dress in Black. - size 0 (also in 2,4,6,8) Self: 100% viscoseLining: 100% poly. Dry clean only. Fully lined. Chiffon fabric with ruched detail. Buttoned cuff sleeves. Hidden back zipper and loop button closure. Imported. ALLR-WD1. WD413P.